Presented in partnership with the Bay Area Video Coalition (BAVC). Update: We’ve concluded the Youth Media Challenge. 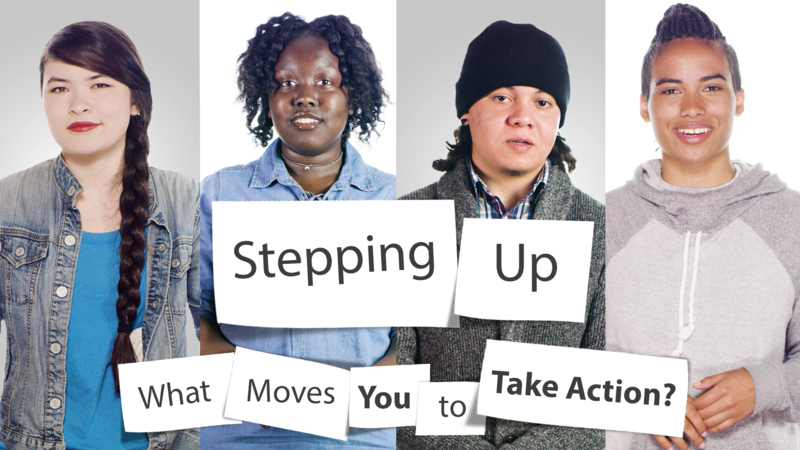 Thanks to all who shared how you’re stepping up in your community! Check out the student submissions and read all about our live showcase in San Jose. Maybe you were motivated by a specific program or club you joined, like Naudika, Veronica S., and Veronica F. were. Maybe you started your own club in response to the issues around you, like Walter. Maybe you’re not part of a program or club, but every time you see a piece of litter on the ground, you make a point to pick it up, or when you see someone being bullied or someone using demeaning language, you speak up. KQED Teach, a free online professional learning site, is designed to help build your multimedia production skills to support students in the Youth Media Challenge and other classroom projects. Check out the self-paced courses on video storytelling and audio podcasting! Submitted works must be your own and not violate any copyrights. For video and audio content, here is a resource for royalty-free music. You are between the ages of 13 and 18. You made the work yourself. When I learned about the Charleston Nine, I felt strong enough to act. I remember sitting in the living room, watching the news, holding my boys, and crying in shock and horror. I couldn’t believe this was happening, and I felt so much fear. How do I protect my family and raise these three boys to be safe in a world where someone could decide to take their lives simply because of the way that God created them. Once, when I was in 10th grade we were having discussions in class about topics ranging from if Netflix is good or not to racism and pride in America. All part of a project. The subject of abortion came up and a lot of people who said they were pro life spoke up, but I remembered them being extremely homophobic so I spoke up saying if you had a child and did not want to abort it because you are pro life, but you would not accept them as gay or transgender then you are not pro life because you may be supporting them to be alive, but you are not supporting them to actually live. Wow, Nikki! This took a lot of courage and bravery. I’m proud of you for speaking up. Very powerful! I was most inspired by Veronica F. because when those peaceful protest happen and then people start throwing things and spitting it can very easily turn into a violent protest or just an all out fight. Veronica said that they stayed peaceful though and that is hard to do. she also inspired me the most because I have seen many people protest an issue or say it is wrong but the moment someone comes up to them to find an alternate way or to help them they turn them away. She inspired me too. She has a good purpose for the pro-life action and reaching out to people in need or people that need advice. I agree, Ethan. I think it’s amazing that she’s not only telling people not to have abortions, but she’s actually helping mothers or mothers-to-be obtain the resources they need to care for their children. I agree with Walter. Today since people see that some of us are Hispanics, they treat us so bad and it hurts too much. I’ve known people, even families that we know, being separated from their own parents, brothers, sisters, etc. It hurts me too because I don’t know what i would do if my parents get seperated from my siblings of 2, 9, and 13 years old and me. It would hurt us too much. So this is one of the things i would stand up for and it’s for My Family. Dalia, thank you for sharing. I can’t imagine being separated from my loved ones, and I know that this must be extremely difficult for the people you know that have been affected by this. I know that immigration is a highly debated issues, and many people are looking for answers; however, separating families should not be part of the solution. I think that it’s great to have young people standing up for what they believe in or things that motivate them! What motivates me the most is when people doubt me or tell me that I cant do something. I want to prove them wrong and be very successful in life and give back to the people in need. When i see people standing on the side of the road it makes me want to jump out of the car and give them food or whatever they need, even though sometimes they need money for drugs or whatever, it still makes me sad that they don’t have food or a home to sleep in! I agree, Ethan. I think that most people who are homeless do really need help. Yes, they may have a drug addiction, but drug addicts need to eat, too, right?! I have a friend who will stop and buy food instead of give money directly to the person in need. I think this is a great idea. Have you heard of The Lot Project. It’s an organization in downtown Anderson, SC that serves the homeless. You should check it out. when I first learned about the issue with bullying in schools, I felt encouraged enough to act. I remember sitting in my 7th grade class and they was drilling in our head that bullying is wrong and if you see someone bullying someone tell someone or say something. I never took it serious until my friend was being bullied so bad she felt as if ending her life was they way out. Most schools do not take bullying serious at all. they say they do but in reality they just talk to the victim but never have anything to say to the bully. So since mid way into my 7th grade year I started paying close attention to the way people treat others. Every time I see someone being mistreated I tell the person harassing the kid to back off. I think that helps the victim a lot because they know they have someone their to stand up for them and be their. I agree that lots of schools and teachers don’t take bullying as serious as they say they do I have seen kids getting bullied right in front of the teacher and the teacher doesn’t do a thing, or they do something and it is like the kid got tap on the wrist and a warning saying don’t do it again. That’s so awesome, Hailey! And it takes courage to stand up for other people who can’t stand up for themselves. Thank you for sharing this.